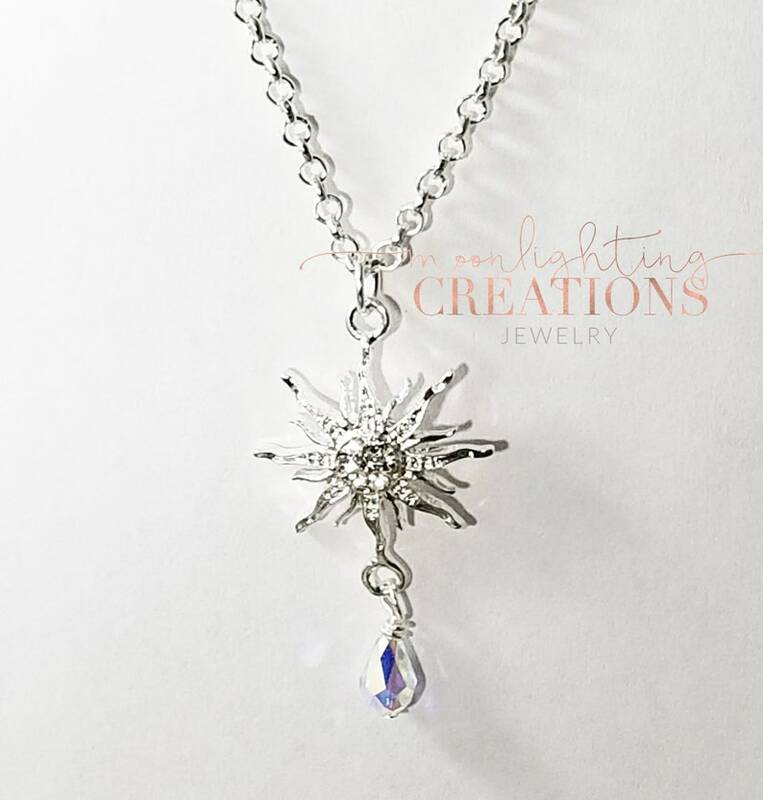 Custom Order…Silver clear rhinestone sunburst crystal charm, swarvoski crystal pear shaped swarvoski bead on a Sterling Silver Plated 18 inch Rolo Chain. Beautiful necklace, great for everyday wear or theatrical performances. Comes packaged in a gift box, perfect for gift giving. Thanks for stopping in and looking! This item will ship out 3-4 days after being bought. Moon Flower Crystal Bracelet, Swarovski Bracelet, Multicolored Crystal Bracelet. It is a gift for my niece for Christmas. She loves Phantom of the Opera. It came very quickly, in fact a couple of days early. I can't wait till she opens it. I would shop with this company again. This piece of jewelry is exquisite! Beautifully made and so sparkly. Fast shipping too! Thanks. Thank you it was beautiful and my daughter in law loved it. Paypal is prefered but I'm willing to accept money orders as well. Item will be placed back onto my shop, after the 3 months have ended and payment has not been met, unless I have been contacted by the customer. I want my customers to be happy with their purchase so if there is any reason you aren't completely happy with your jewelry, please let me know as soon as possible so I can make it right. I do combine shipping, but the majority of my items are set for a flat rate fee of $2.50 for shipment within the US (USPS First Class)for the first item and only 2.00 for each additional item. If you need something faster and/or with insurance, just let me know and I'll modify the listing to reflect this. I also encourage insurance on all items. Vintage Moonlight Crystal Bracelet, Swarovski Bracelet, Multicolored Crystal Bracelet.